Give in to the power of the crafty side! 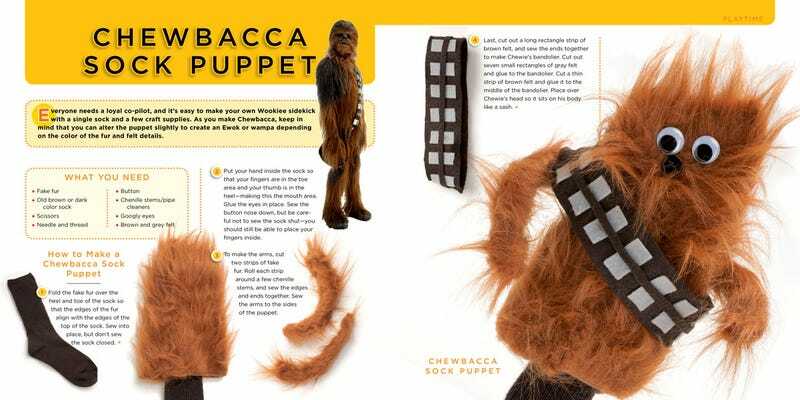 The winsome Bonnie Burton of StarWars.com has published a terrific, fun crafts book devoted entirely to creating Star Wars plushies, puppets, pillows, decorations, and more. We've got a sneak peek! Lucky for you, there are even two craft ideas in here that you can try this weekend, with the help of Burton's easy-to-follow instructions. We love this colorful, cute book whose crafts run the gamut from home decorations (Space Slug Draft Blocker) to science-oriented projects (AT-AT Herb Garden). Plus - an entire section on fashion, including R2 D2 beanies and Amydala punk rock t-shirts. Even if you can barely use scissors and have a tendency to eat glue, you'll find crafts in here that are at your level of mastery. And for the Jedi crafters among you, there are some great challenges. The Star Wars Craft Book comes out March 29, but you can pre-order it!